Seriously? Is it just me, or does this week seem to be flying by a little faster than it should? I’m not complaining because I love the weekends like the next person, but I kind of want to be like, can I get off this ride, it’s nap time! Last night I had a work event so I was out super late and didn’t get to bed until later (11 ish, I’m getting old! ), so I thought my lack of sleep would make today drag, but it didn’t. By the time I looked at the clock it was lunch time and I drooled over Don Draper watched Mad Men and ate my lunch. The afternoon went by just as fast as the morning and I got a chunk of work done. Since I didn’t have to work at my retail job, I knew I wanted to get to the gym, but I wasn’t sure what I was in the mood for tonight. I texted a friend of mine who teaches Zumba and does a class on campus a few times a week. I had taken her class when I was at my old gym and we stayed in touch. She said she was teaching tonight and I should come by. MUSIC TO MY EARS! As soon as I got home, I got straight to business- changed into my workout clothes and made myself some dinner. Her class is from 730 to 830 and dinner after was out of the question. 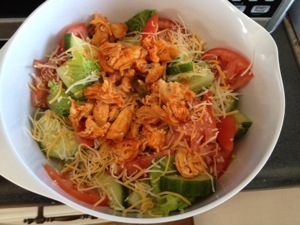 I made buffalo chicken salad with extra Frank’s Red Hot. I’m obsessed with hot sauce and I’ve been craving wings lately, so this was a good alternative. While there is some cheese on my salad, everything else I’ve eaten today was squeaky clean so a tiny bit wouldn’t hurt and I would rather get rid of it faster than have it sit around or throw it out (world hunger and all). After all the eating I did today I feel pretty good. It’s day 3 and I’m way less bloated than I was on day 1. Changing my workouts up a bit is also feeling pretty good too. I’m pushing myself without feeling like I’m going to far or have the chance to injure myself. After dinner I worked on a recipe post from the other night and then headed off to Zumba. I had never done any of the routines in this class, but I picked it up pretty fast. We did the Footloose line dance, and OMG your left leg gets such a workout! There needs to be a change up when you switch sides and use the right. I’m sure I’ll feel this in the morning. I had some awesome energy after class so after I got home and showered I made two things to eat over the next few days: another pizza and paleo breakfast muffins. I put onions and mushrooms on this pizza because I had some left over veggies in the fridge. I definitely let it cook a little longer than the one from the other night, yay for crispy crust! The breakfast muffins are actually on my 50 recipes in 2014 list and something I found on Pinterest, but the post is from another fellow WordPress blogger. Check out my post and check out Pop an Egg on It, the blog I got the recipe from. Well with the momentum of the first three work days, tomorrow is packed so I’m heading to bed. Happy Hump Day!